The API 205L Instrument Direct is specifically designed to accept a guitar or bass direct into it, without any loading on the pickups. The Gain Control is used to normalize the instrument's input level, up to a +4 dBu output level. With the use of the unique TONE control, the low end "mud" can be reduced. Turning on the BRIGHT switch adds clarity, like the bright switch on any amp. The combination of these two functions may eliminate the need for any EQ on the instrument when recording, keeping the signal pure. The input is designed specifically to load a pickup the same way that a tube guitar amp would, retaining all of the tone, and minimizing the loading effect on the pickup. This minimal path eliminates the need to use a standard direct box, which more times than not only converts the signal to a balanced mic level output, which still requires a mic input, equalizer, and fader to get the signal to a recordable level. The 205L is capable of boosting any instrument to a hefty line level without additional amplifiers. With the 100 K LOAD switch, the tone of the pickup can be altered slightly, which tends to darken the high frequency content. The BRIGHT switch adds a treble boost in the same manner that most instrument amplifiers do, clarifying the instrument and adding presence to it without the need for outboard equalization. 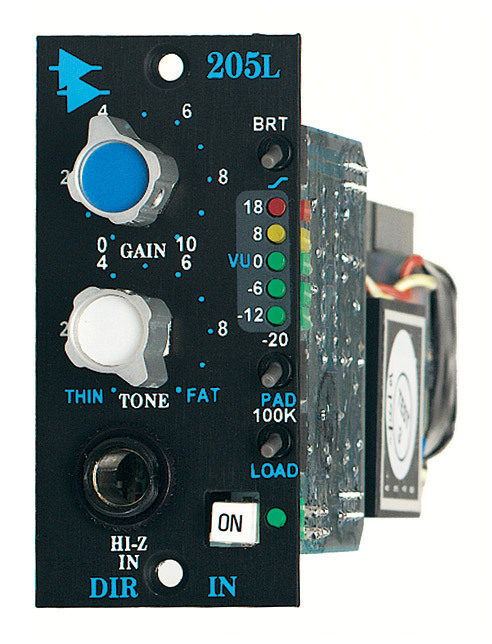 When inserting an instrument with an internal preamp or a line level instrument such as a sampler or a keyboard, the 205L has a 20 dB PAD switch to drop the level without loading, thereby retaining the full range of the 205L and its features. When used with other 200L series modules, a complete input strip can be built from input through dynamics, equalization, and final output. Also, the output of the 205L can be fed to tape, or the input of a guitar power amplifier. The artist can then be in the control room while the instrument amp is isolated in the studio. The 205L can be used in the Legacy or Vision Series Consoles, or in the L200 Rack. The 205L Direct makes use of the 2510 and 2520 op-amps and therefore exhibits the reliability, long life, and uniformity characteristic of API products.